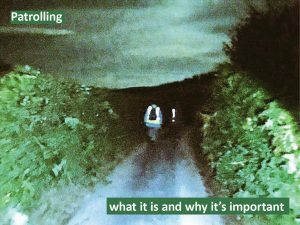 This was the first time that Defra/Natural England/the NFU’s claims of widespread intimidation and harassment of farmers during the badger cull had been tested robustly by legal process. During the pre-appeal-hearing process, much was made by Defra and Natural England about the amount of ‘evidence’ they could produce in support of their assertion that intimidation and harassment were widespread. This was a key plank of Natural England’s defence of the decision not to release information. In spite of having the entire weight of the Government and the NFU behind them, during the appeal Natural England’s ‘evidence’ crumbled to a few witnesses unable to substantiate these claims. This case, heard in a London court room, was the result of a request by three members of the public for information on the badger culls from Natural England. Natural England refused to disclose certain information claiming that its release “could endanger people’s safety for no good reason”, but eventually they were required to defend their decision in front of a Tribunal. They lost – and they lost comprehensively. This victory for members of the public was a “David and Goliath”style battle and demonstrates that it is possible for plucky individuals to go up against the Establishment and win, if you can present the facts, the truth and the science effectively. Click here for the summary of the Judgment.